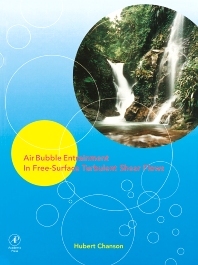 This book develops an analysis of the air entrainment processes in free-surface flows. These flows are investigated as homogeneous mixtures with variable density. Several types of air-water free-surface flows are studied: plunging jet flows, open channel flows, and turbulent water jets discharging into air. Experimental observations reported by the author confirm the concept that the air-water mixture behaves as a homogeneous compressible fluid in each case. This book will be of great interest to professionals working in many fields of engineering: chemical, civil, environmental, mechanical, mining, metallurgy, and nuclear. PART I: Introduction: Mechanisms of Air Bubble Entrainment. Similitude and Experimental Studies. Air-Water Gas Transfer. PART II: Plunging Jet Flows: Presentation. Air Entrainment by Plunging Jets. Air Entrainment in Hydraulic Jumps. Air Entrainment in Plunging Jet Flows: Related Cases and Gas Transfer. PART III: Self Aerated Open Channel Flows: Self-Aerated Flows - Presentation. Air Entrainment in Steep Chute Flows. Air Entrainment in Small-Slope Waterways. Air Entrainment in Partially-filled Conduits. Air Entrainment in Open Channels: Discussion. PART IV: High-Velocity Water Jets and Related Air-Water Flows: Introduction to High-Velocity Water Jets Discharging into the Atmosphere. Air Entrainment in High-Velocity Water Jets. Ventilated Cavity Flows. Spillway Application: Aeration Devices. Part V: Summary and Conclusion. Appendices. Subject Index. Author Index. Hubert Chanson is a reader in fluid mechanics, hydraulics and waterengineering at the University of Queensland, Australia. His research interests include hydraulic engneering, design of hydraulic structures, two-phase gas-liquid flows, mixing and dispersion in coastal and estuarine zones. He has had over 200 international refereed papers, written 7 books and has been an active consultant for both governmental agencies and private organizations.